It's challenge day over at 2 Sisters. This week's challenge is to create a card/project using the theme of 1-2-3. The items can be anything as long as you have 1 of something, 2 of something else and 3 of another item. Our sponsor this week is The Crafting Boutique. For my card I used 1 image, 2 flowers and 3 butterflies. The image I used is Bye Bye from Mo's Digital Pencil. I created the base of the card in pastel blue and added a piece of pastel blue backed in white. Then I embossed a piece of white card stock and backed it in pastel blue and then again in white. I colored the image using Spectrum Noir pens and backed it in pastel blue and then again in white. I punched butterflies from pastel pink card stock. I added 3 light blue rhinestones and star dust stickles to the butterflies. I colored 2 white paper flowers using Spectrum Noirs PP1 pen and added a blue twinkle goosebumps to the center of each one. I added 3 light blue rhinestones to the image, 3 more to the piece of embossed paper and 3 pink twinkle goosebumps to the upper corner of the card. super adorable card, love the details. Thanks for sharing with us at Loves Rubberstamps this week, hope to see you again soon! Super cute card! Love the image and your design. Thanks so much for joining us at Wags n Whiskers. Hope you have a wonderful day! Lovely card, super image and great embellies, thanks for sharing at Fab'n'Funky this week. Absolutely adorable! Love the image and the soft colours! 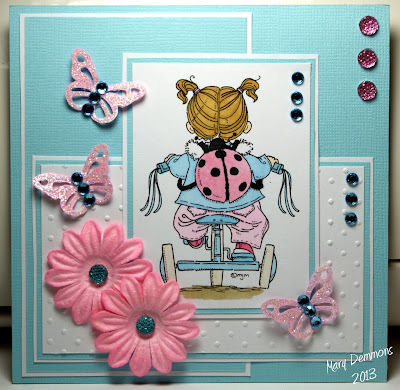 thanks for joining us at SweetStamps Challenge this week! Adorable card, I love that image, so cute! Thanks for joining us at ABC Challenges. This is very pretty! Love the colour combo! Great job with our 3-2-1 challenge at Crafty Catz too. Thanks for sharing and good luck! Such a sweet image! Thanks for participating in the Sister Act Card Challenge!! what a lovely card. love your coloring technique. thanks for playing along with us at little tangles.